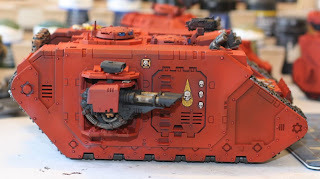 The first stage of weather is now done for these tanks. 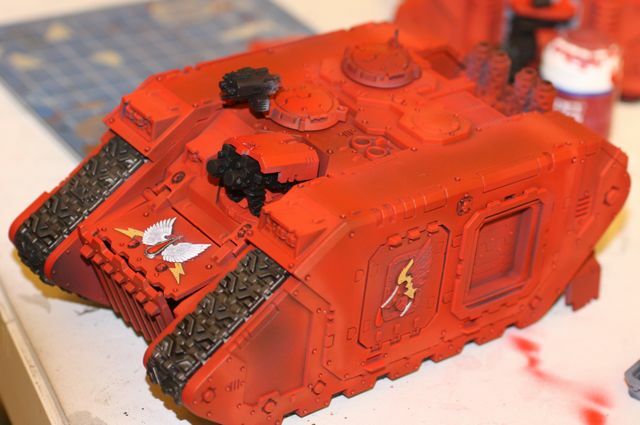 I think I was able to match the dust on the death company rhino, but I am not quite sure. 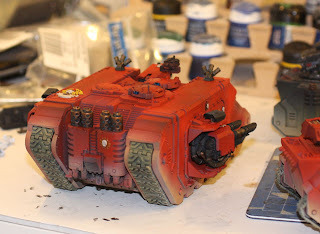 I used snakebite a very runny leather/bleached bone air brush concoction along the tracks and skirt. 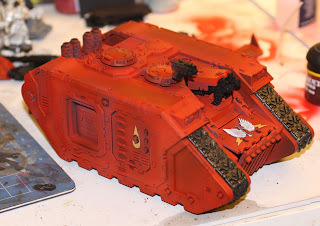 I think my next step may be to sponge on a little bit of battle damage. 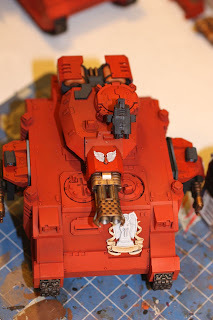 I was thinking of using a single pass of boltgun metal, but maybe chardon granite would be better, since there would be more contrast with the rich red color. After that I am going to put on some some decals and ash colored weathering powder on the tracks. 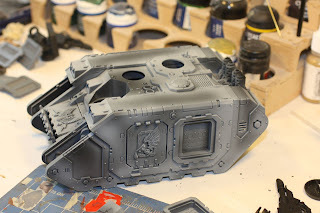 It think the weathering powder is important because it provides another texture, even though it is very close in color to the dust I air brushed on. I am really proud of these tanks so far, and can't wait to plunk them down on the tabletop. 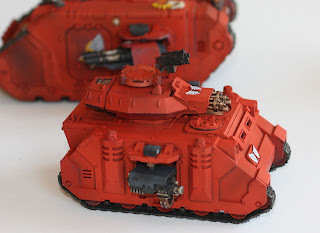 They are wildly different in style than my old tanks though. 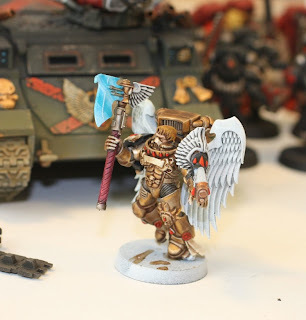 So I painted up one God Hammer and two Baals, but have yet to weather any of them. 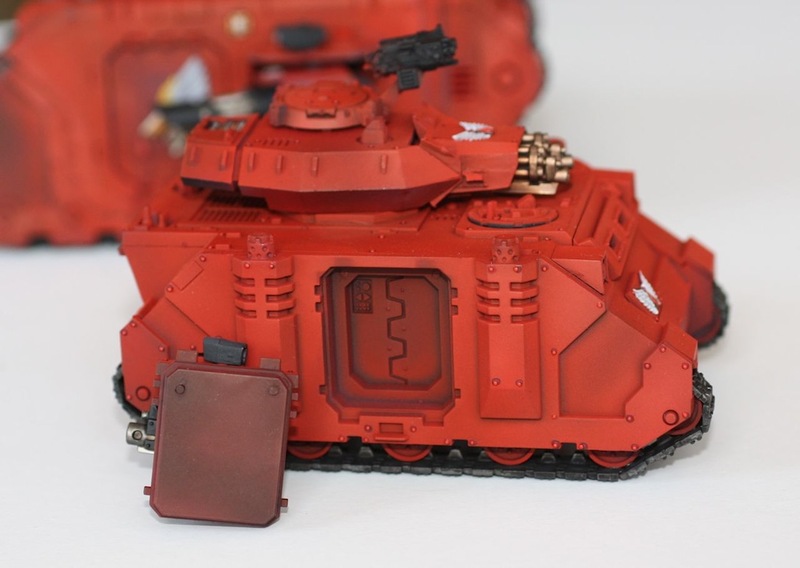 I know it needs to be done, but the idea of factory fresh tanks is kind of nice right now. 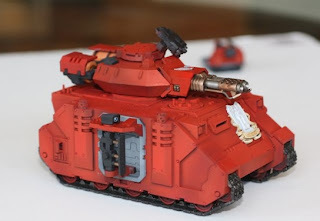 I magnetized the ammo carrier portion of the turret so this Baal could switch from being a flamestorm to a regular assault cannon version, or even to a rhino or razor back. I have no idea what to expect from the flamestorm variant, but I wrote a poem expressing what I expect will happen. 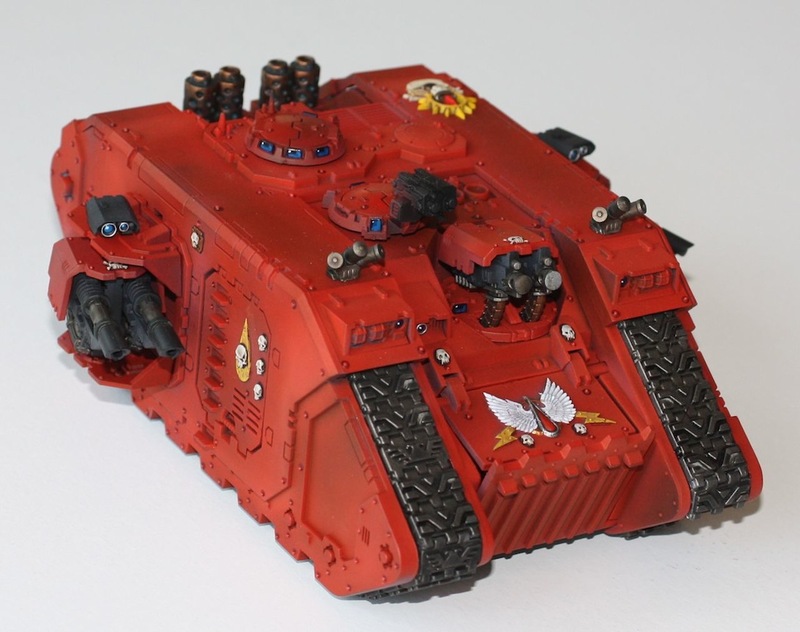 So how bad is this tank? If I zoom this thing 12 inches forward I only get to fire the flamstorm, so the sposons get wasted. I suppose the tank could survive close combat, but that has not been my experience so far with these things. 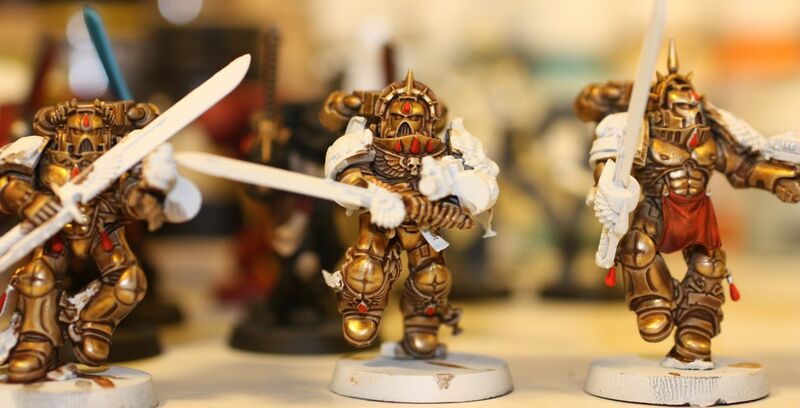 Perhaps they would work well as objective holders? I painted up two Baal predators to flank the LR and death company Rhino as they all charge into battle. On the off chance I field these guys as rhinos, I had to magnetize the side guns so they can be removed. 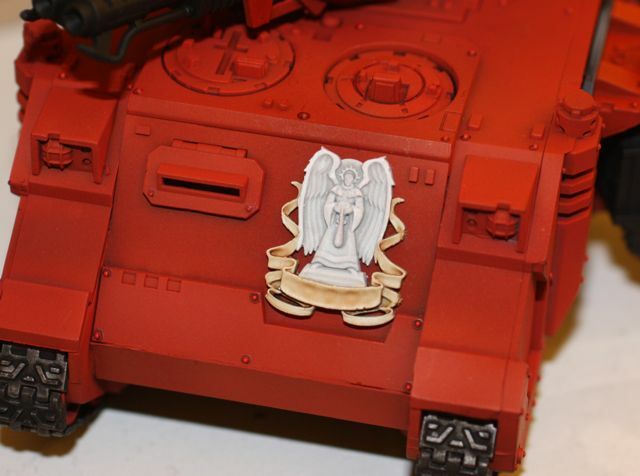 I used the rare earth magnets that I normally reserve for infantry. You can see the recessed magnets in the old style Baal with the hatches exposed. Like the LR, these guys will get weathered once the base coats and transfers are done. There is still quit a bit to paint, but the armor is looking pretty good to me. The red tones are a little more muted on these guys since I used a slightly more complex red recipe before I discovered that simply going over the pre-shading with blood red was the way to go. Notice there are two baals in the photos. 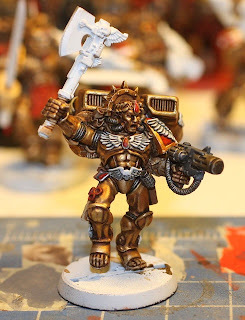 I would not want anyone to think that I only paint one Baal at at time. Still missing one track, but I think I am going to take the sage advice from Siph_horridus and build a LR Crusader to go along with this. 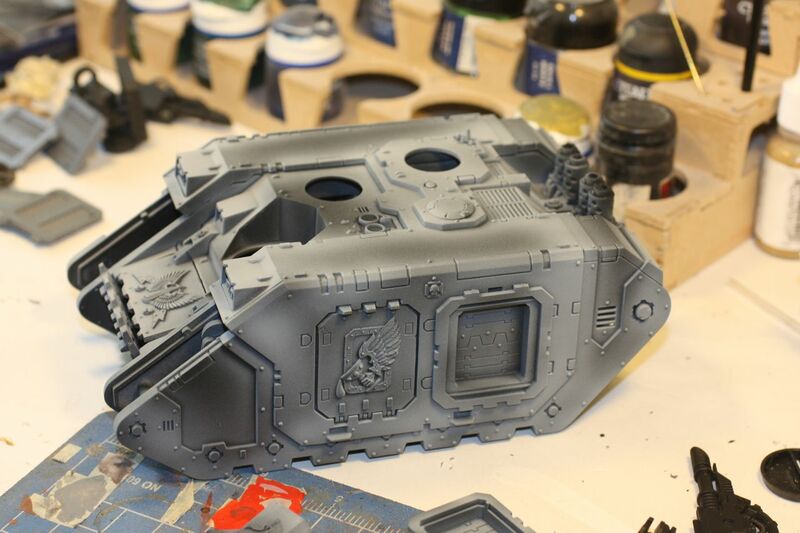 The crusader will be missing a track underneath the frag grenade launchers, so it won't even be noticed. 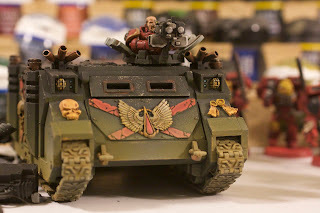 I have some work to go on this guy, including finishing painting the storm bolters, headlights, and engine, but I could not resist putting some photos up. 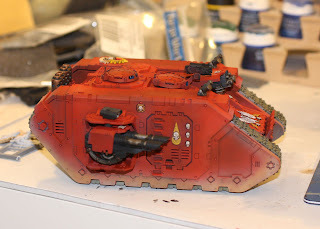 I plan to weather this guy like the death company rhino, but I am really enjoying the clean look right now. 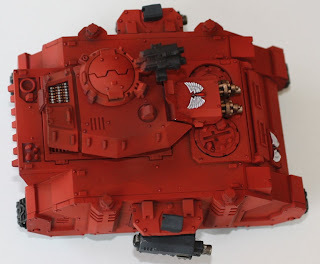 I wish I could get a vindicator into the list! I have a whole slew of tanks being prepped for my new and improved torrent of fire BA army. 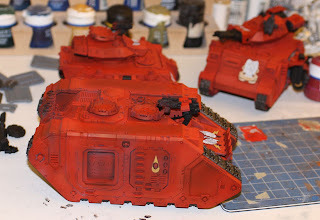 If you look back at my earlier posts you can see pictures of my old dry brushed beaten up ba tanks. 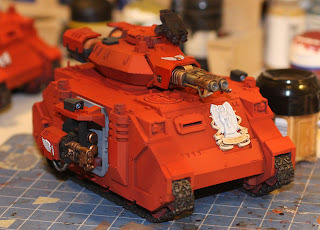 After having so much fun with the airbrush on the Death Company rhino I decided to add two Baal Predators (both magnetized) and a Land Raider God Hammer. The GH is not the most effective tank for my force, but I wanted to paint one so that was that. Behold the power of instant gratification! I tried two different airbrush techniques on these guys, though they started off the same way. 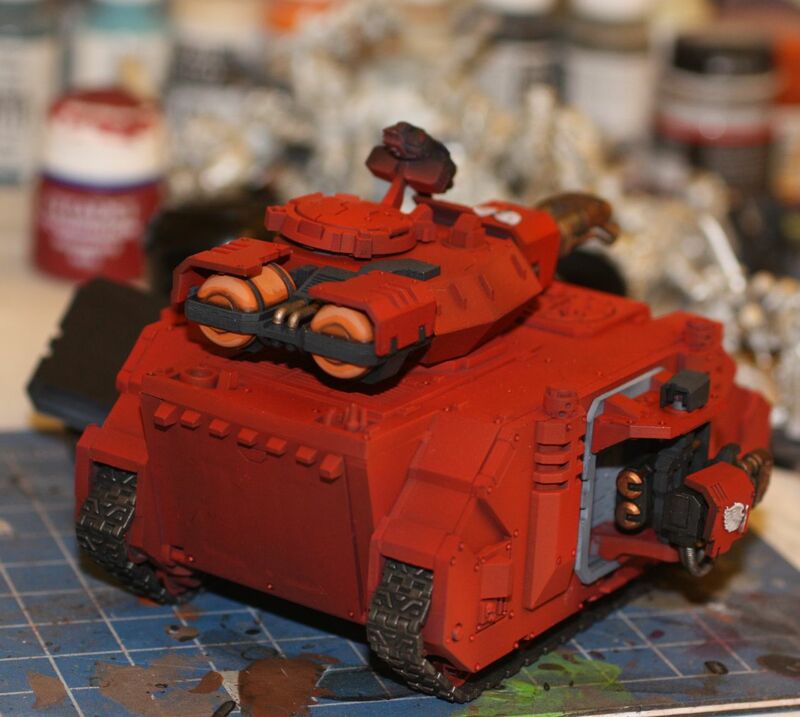 After my earlier attempt using varying base coats I decided to give pre-shading a shot. I base coated all of the tanks black, and then use fortress grey to dust them. 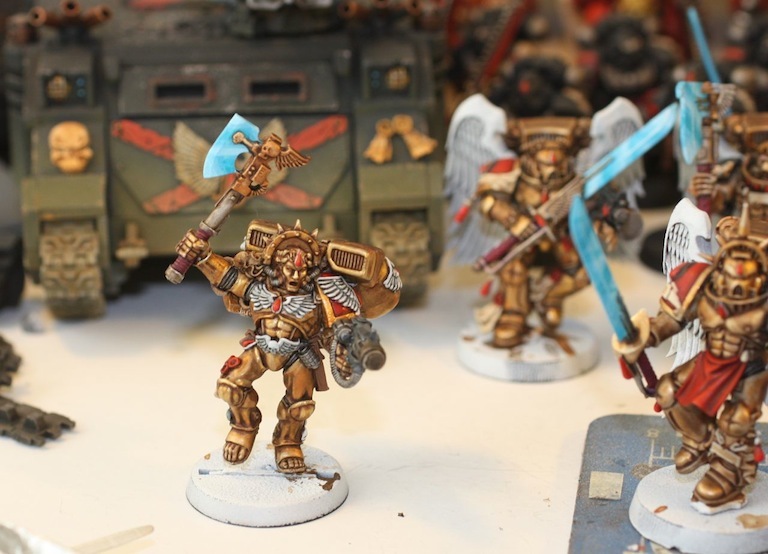 At this initial step I had the itch to do a space wolves army. 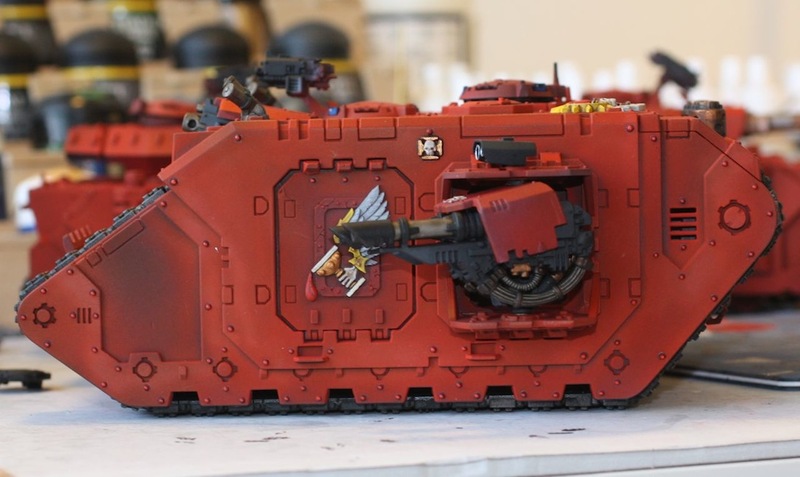 I could see adding some warm brown/yellow panels and battle damage to the tanks after the pre-shading step and being really pleased. 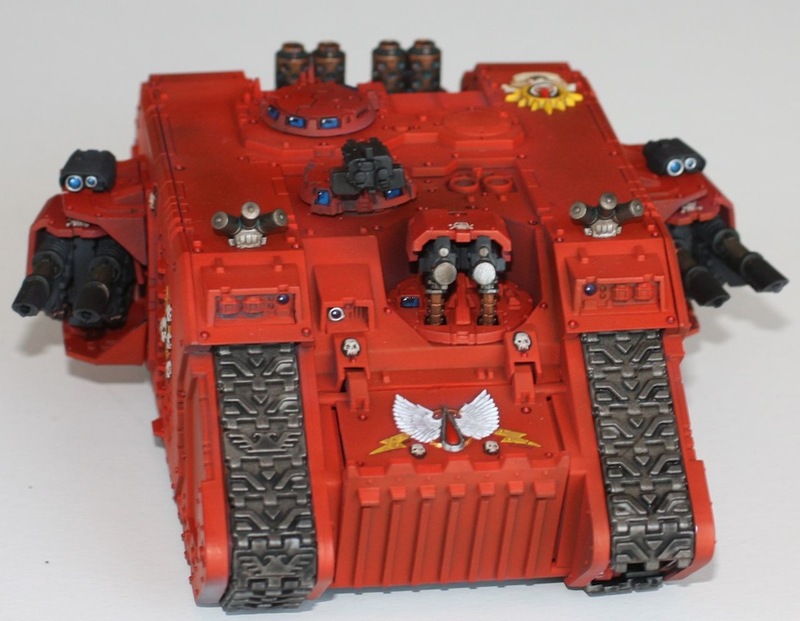 However since these were BA, red had to follow. 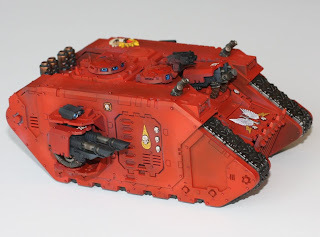 In addition to the two preds and the LR, I picked up a vindicator to add to the mix. This should give my regular gaming buddies a pretty hard force to fight. Three Baal preds out flanking, with a convoy of death company in a rhino and assault marines in a LR, supported by a vindicator and drop pod dreds. 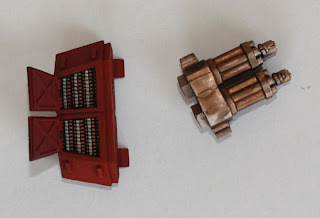 Oh on my zeal to get painting I accidentally threw away one of the track segments for the LR, so there is a missing segment on the front! For 20+ years I have not liked blue power weapons. I may associate painting swords blue as something from my childhood, and that the more gritty realistic approach to painting is the adult way to paint. (if such a thing is possible when talking about painting toys!) 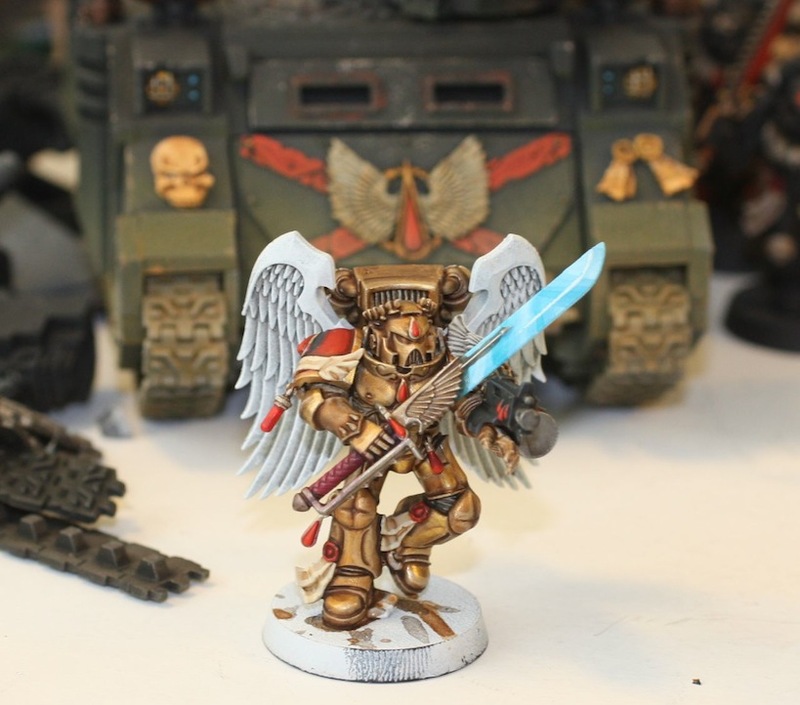 However with the blood angels release, fantasy like poses, and over the top style, I could not resist. 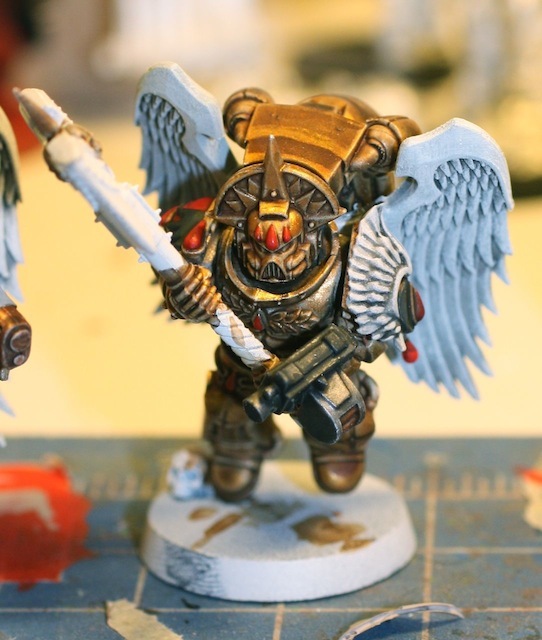 So may I present My Sanguinary guard with bright blue patterned weapons! 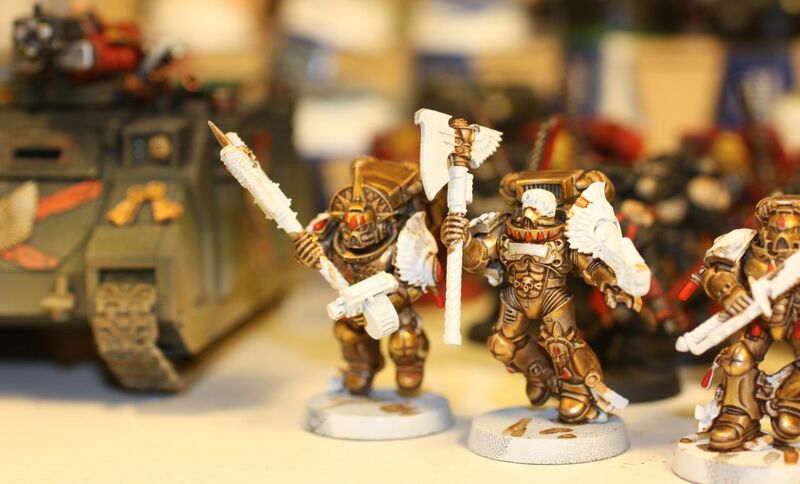 My honor guard have dry brushed blueish weapons, but for these guys a went with a very bright layered scheme. To get the fine white edge highlighting I just put some tamiya thinner on one of my detail brushes and just erased the painting along the edge. I used the thinner to try and soften the blends a bit by just painting the thinner on the blades and allowing the blue to run together. It is going to be weird to paint flesh tearers after this, since they have a much different appearance. 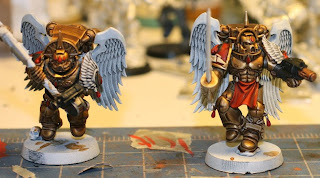 Sanguinary Guard WIP 2: Now with wings! 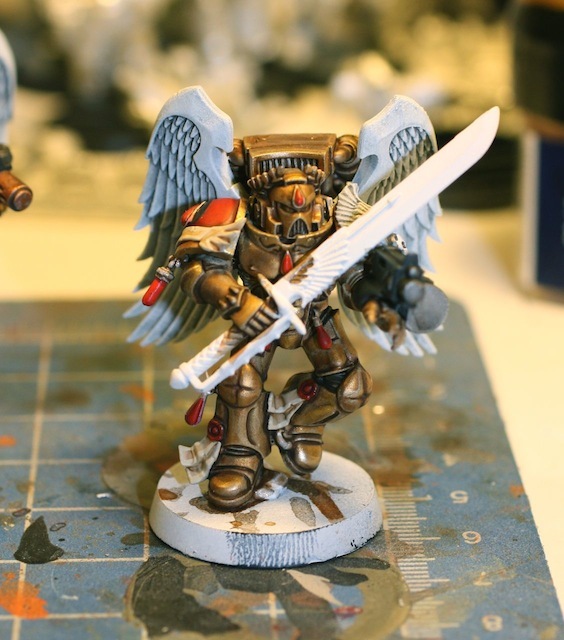 Even though I haven't painted Dante's axe yet, I've moved on to the SG. I painted the wings astro-gray, washed black, and then dry brushed astro grey again followed by two white dry brushes. I was planning on layering the feathers, but I just did not enjoy the task, and figured that the chalky texture from dry brushing would not be bad on things that are supposed to look like wings. 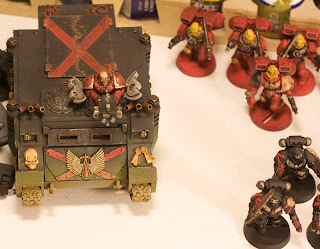 In other news, I finally received my GW blood angels order yesterday, and have been reading through the codex and figuring out how to equip the assault squad to accompany Chapter master Seth. Like my IG, I decided to build up a multi-chapter BA force. 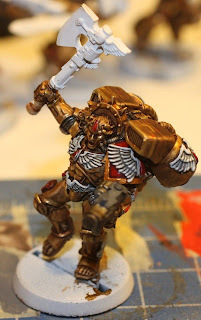 I think the mix of units is fluffy as well as interesting to paint. 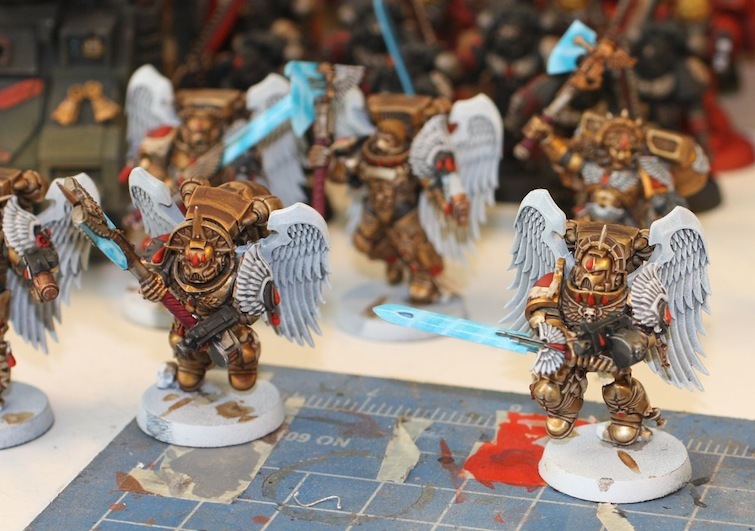 I've also decided to rebase my entire army. 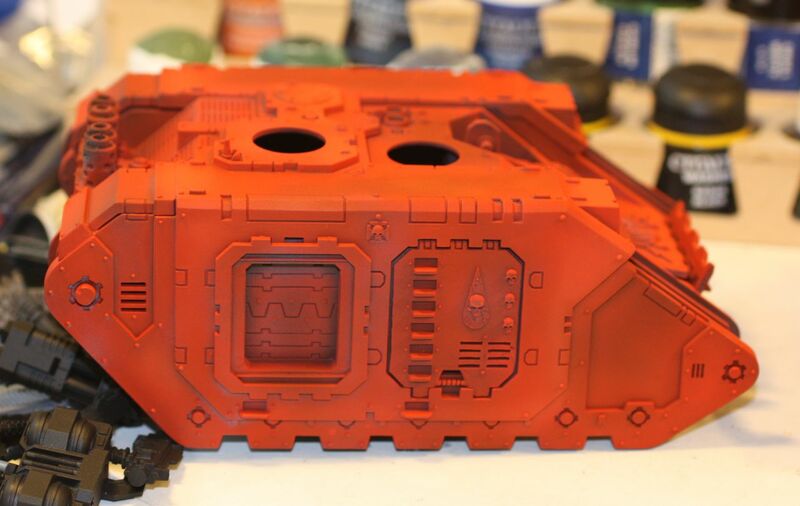 Hopefully this will tie in the different paint styles a little better. 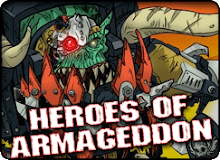 And yet another bit of news. A FW order from ages past just arrived. I just have too many projects going on at the same time! 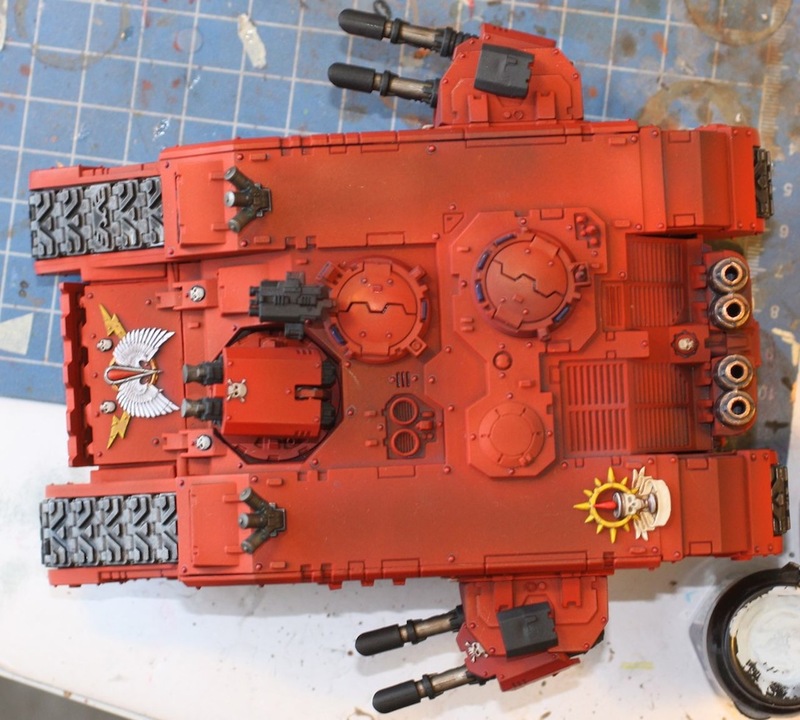 I've made more progress on Dante and thought I should share. 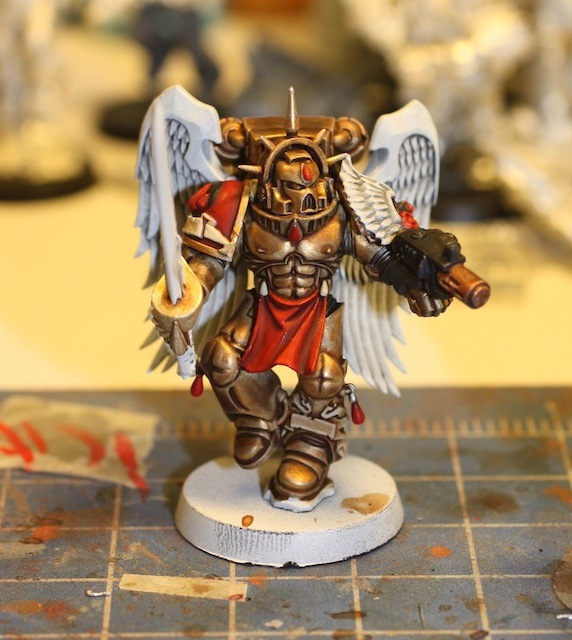 I tried out the color for the BA wings on him prior to giving it a shot on nicer Sanguinary Guard models. Isn't it weird to view the metal model, as the test mini? 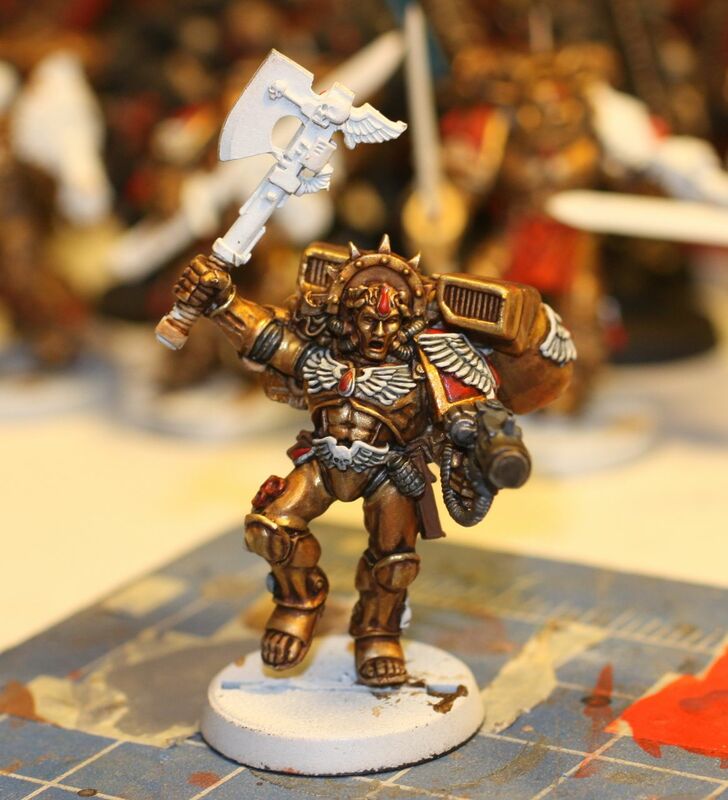 The plastic models have such better detail that I figured I would risk it on this old iffy sculpt. It seems it would be better to just create a new Dante out of SG bits. That's all it has taken so far. I figured I had better document this since, I have two more boxes of these guys coming in! 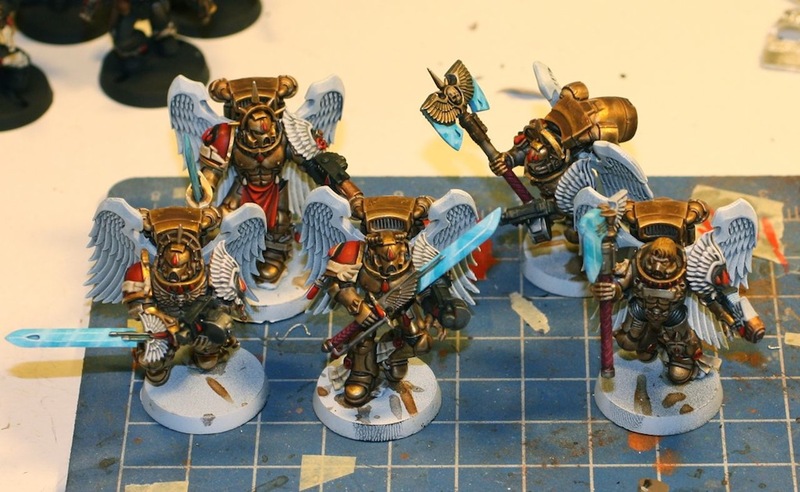 Since my GW order is perpetually help up(forgot to split the order), I've had some time to work off some old models. 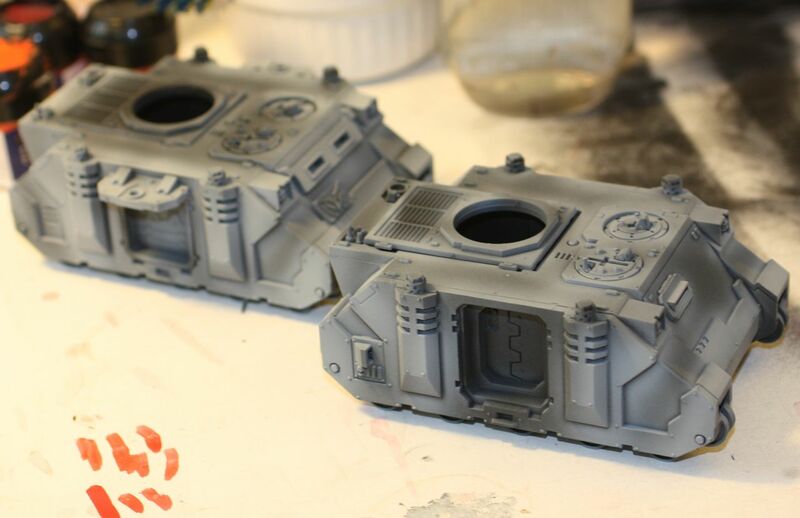 After my first DC marine, I changed my black formula and removed the badab black wash and the fortress grey hard lining from the equation. 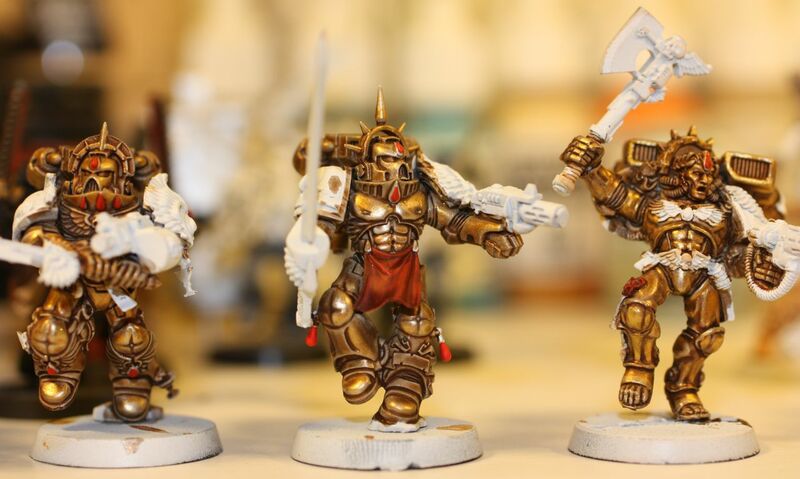 I think the subtle color shift from the air brush is just enough to make these guys stand out. 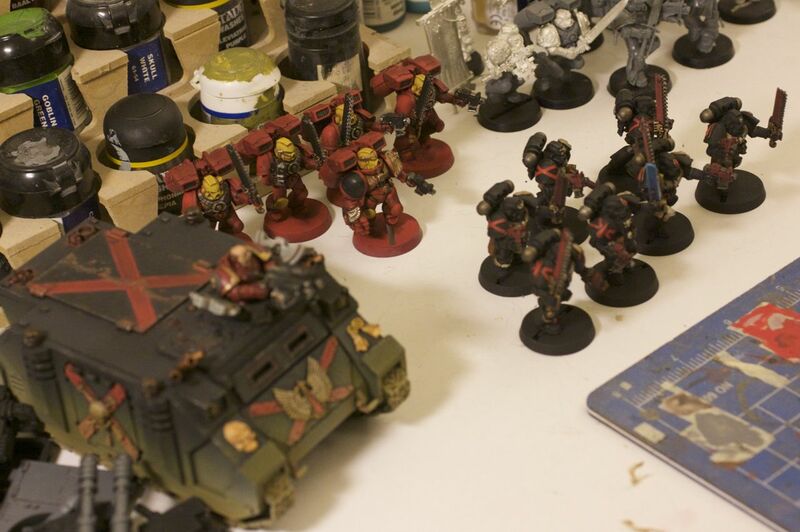 I've got a little shading left to do on the red, and still have to paint their eyes, but I am comfortable placing them next to the assault squad painted earlier awaiting basing. 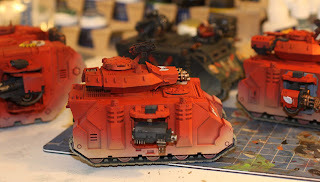 Shall I mist snakebite leather on their legs so they match the rhino? I know I said I would do it, but now I am hedging. 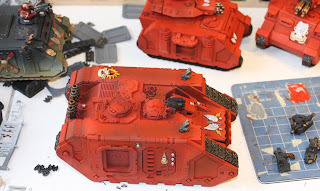 In other news, I played in a narrative IG versus unlimited Tyranid game this weekend, and captured some video and stills. If the video works I might try to record a painting session. There a plenty of good sites online for tutorials already, but it would give me the change to experiment with my Mac a bit. Anyone else excited about the big anniversary game at the springfield GW store?